We have so many things to be thankful for here in the United States. We take too much for granted. I think back on when we used to live in Sudan, as missionaries. We didn't own half of the nice things as we have here, but we were gloriously happy. Take today off, and just sit back and relax, meditate on all the marvelous things God has given us. He deserves every bit of the glory. I feel sooooo stupid. I just basically lost my entire novel. All. that. work. Gone. Alright. I guess I should explain some. I was heading to my grandparents house for thanksgiving where there is no internet, so I copied the whole document from google docs online to a notepad on my computer, so I can still write without the internet. Well, guess what happened? I only copied two chapters. And then when I finally get the internet working, I realize that for some crazy reason there are only two chapters left in my google document online. So I lost all that work except for a few pages. The good thing about it is I've been backing up my novel every week (should do it every day, I know, I know) and so I have all of last week's writing saved in a different document. Whew. I was at almost 40 thousand (thanks for correcting me, Hannah -- I said 40 words before) words though yesterday. Last week I was at 31,000 words. That's what I'm stuck with now. I was planning to back up my novel tonight. Oh, the joys of writing. But hey, I'm glad the whole thing wasn't deleted. The internet has gone out (oops, now it's back again), and my stomach is sinking. I feel dread, but I'm not crying -- I can't be sad. I can still do this. If I write 3,000 words each day I'll be done before December. I have to read 50,000 words before then. I'll have to rewrite a lot that I've done, but I can't chicken out now. I can do this. I can do all things through Christ who strengthens me. I'm off to read one more chapter of Bonnets and Bugles, then I'm going to write. Like a crazy person. Wish me luck, encourage me please. Cause I'm gonna needs loads of it. thanks, friends. hope you have a wonderful thanksgiving. This week has been a bit of a rush, as many weeks are. I’ve been rushing myself each day, with school, noveling, and running. Yesterday I decided to take back a step, and go along to with my younger siblings to a friends' house. None of the children in that family are my age, yet I had so much fun. I didn’t have have fun as in “I did what I wanted and I got what I wanted”, but I sacrificed a bit of my time to play with one of the girls who is about ten. She’s funny, smart, and sweet - usually she plays with my younger sister, but my younger sister was at home with a cold. So instead of sitting on the couch reading, or playing off with the boys (believe me, I’ve got a habit of going off with the boys - it’s a little bit more fun to play light sabers or kickball than to paint each other’s nails), I decided to play with the ten-year-old Shelby. At first I was bored, we played in her “fort” and moved boards around to set up a house. Then it hit me. This was the same kind of thing I would do five years ago. Have I really changed that much? After that I started to enjoy myself. We chased chickens, looked for dead deer and cow bones (which really was fun, by the way) and then went inside and brushed each other’s hair. And washed each other’s feet. Funny, I know. But it was fun. I had fun just being a little kid all over again. 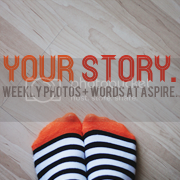 What is your story from this week?